The Bill Coye designed Ridgeback is small enough for comfortable belt carry, but also large enough to have a regular, full handle and to provide the "adult man's hand" enough blade for heavier work. 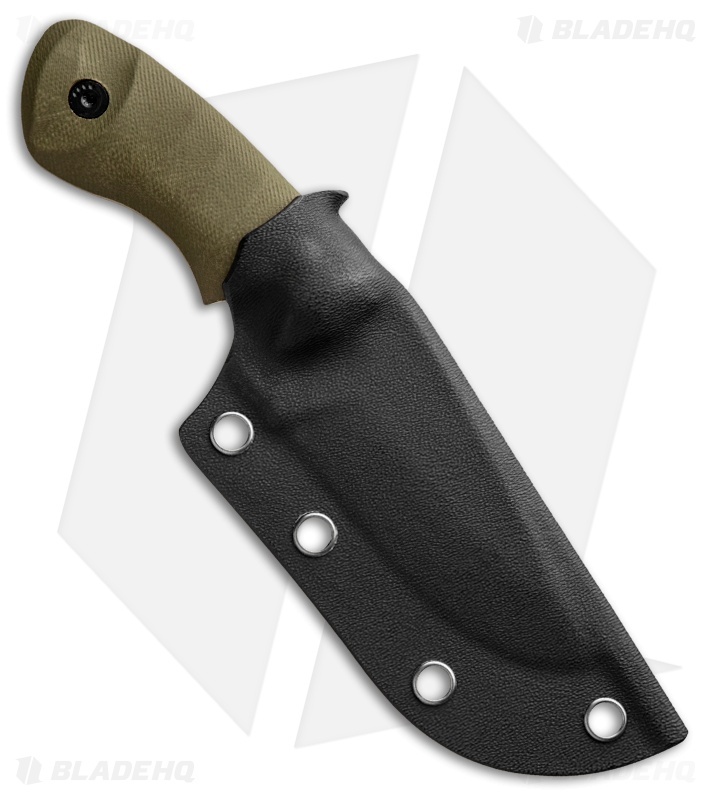 The Kydex sheath comes with a belt carry clip that can be used in different positions. A true all-rounder that can be used for many different tasks. 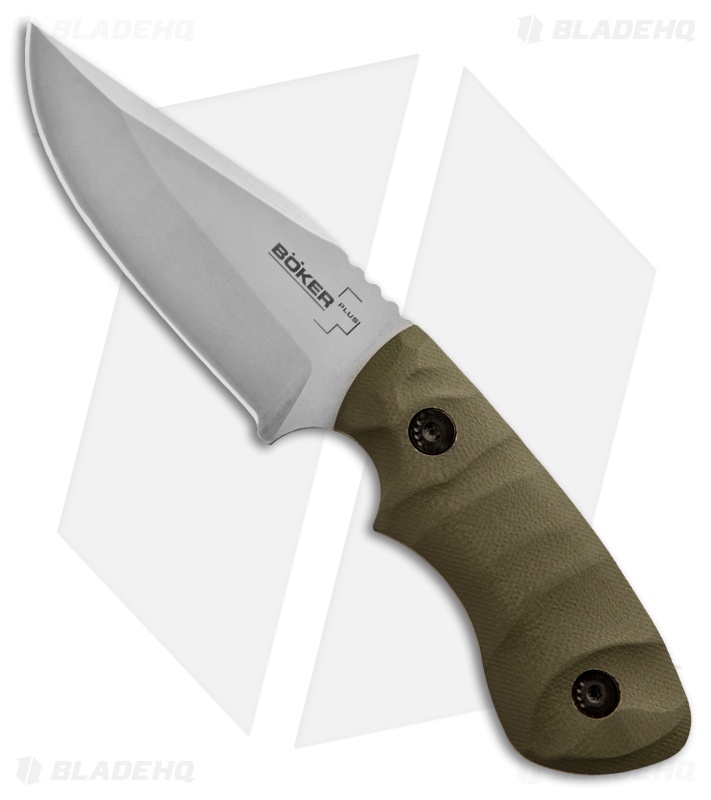 Milled G-10 scales in olive green, with black fiber layer. Bead blast finished 440C stainless steel clip point blade. Treat yourself to a premium aftermarket Kydex sheath for the Ridgeback with heavy duty Kydex and soft loops for horizontal carry. Click HERE! For smaller tough fixed blade knives, I usually have a Tops on my belt, but for those wet rainy days I prefer a stainless blade. The boker fits the role perfectly, great grip for small knife, holds an edge decently well in rough use, fit and finish are very good. The cutting edge was a bit on steepside for me sommi reprofiled to my liking. I make my own leather and kydex sheaths, and yes the sheath is sub par, mostly for the belt clip as the sheath itself is not as bad and does securely hold the knife and does what it is suppose to do, I have two of these and both are equally sufficient for use and are not total junk as others mention but clip is as they say. To those on the fence because of the sheath, again the sheath is not total junk, cheesy yes, but is totally serviceable but the belt loop is junk. I received my Ridgeback today it came razor sharp well put together knife makes for a nice EDC carry knife. the sheath on the other hand and the belt piece are not really worth the time glad I ordered and different sheath. This knife is a great little fixed blade with good ergos. The steel isn’t bad. Sheath is just meh tho. I put some belt loops on mine and now it’s about perfect. Get yourself the Armordillo sheath too! This knife is great, and a fraction of what a real Coye would cost you. The knife really needs the aftermarket Armordillo sheath. It made this thing usable and I was able to carry it with great comfort then. The stock sheath and clip are junk. Good little knife, sheath not so much. The knife is great, esp. for the price! The sheath is so-so, tight fit, but not the best cut and finish, and the belt clip that is included is horrible. Awkward, flimsy, if you buy this knife expect to have to spend extra on an aftermarket or custom sheath.